Welcome to Everide Radiator Warehouses! Welcome to Everide Radiator Warehouses........Please bear with us as we're under construction! Check below for our HOT deals! Want to see a special we're running? Go visit: Our Mercedes Radiator Special! Go visit: Our SAAB 95 Evaporator Special! Want to see some examples of some of the older applications we have parts for? Go visit: Our old and obsolete radiators and condensers section! 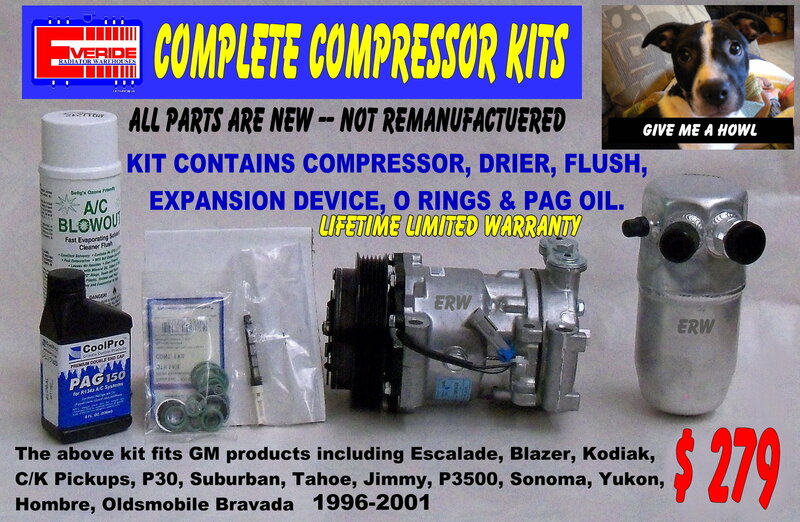 We also carry A/C Compressers such as the kit below! Notes: This is a complete A/C kit that includes everything you need to get your GM truck's air conditioning up and running! Call and give us a chance to serve you! We are open Monday through Friday 8am - 5pm EST.